This is really interesting. 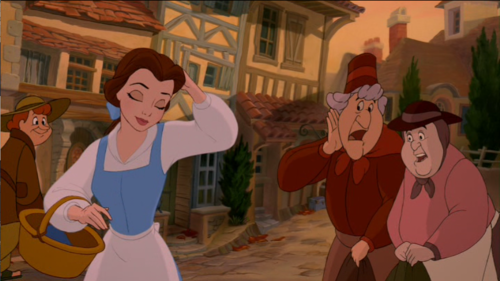 I remember seeing Beauty and the Beast and thinking that Belle somehow looks different from the other villagers, but I never picked up on the color. Some years back I saw commentary to A Cinderella Story with Hilary Duff and they mentioned that they gave her a blue wardrobe and avoided blue for the other characters, including extras, to make her look more out of place. I actually watched the same commentary! 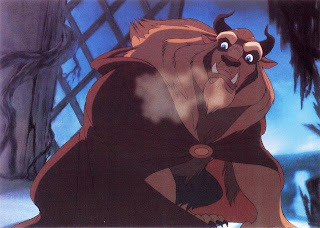 I remember them saying it was impossible to prevent the extras from coming in jeans! I just don't get it though, I don't really consider blue to be a standout color. Belle in blue and gold/yellow, representing her positive influence on the other titular character. 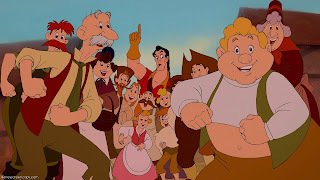 Gaston in red as well as the villagers as we can see, representing his negative traits and influence by contrast. 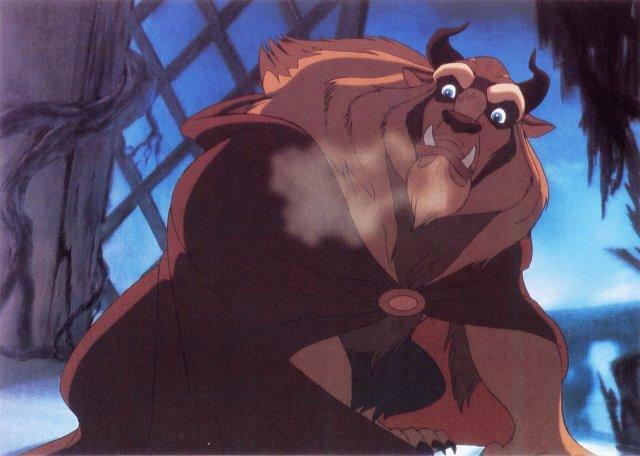 The Beast starts with a purple cloak, representing both his royal status, that he was as bad as Gaston at one, but he's open to become a better person under Belle's influence. due to purple= red+blue. 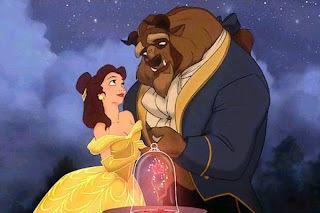 The Beast later adopts his iconic blue-gold/yellow suit ditching any red, as it was him showing his heart of gold as well as opening up to Belle that paved the way to the ballroom scene to begin with, finding he can change. Wow I never even thought about Gaston in red being part of the symbolism too! It makes sense though, red so often represents evil and/or vanity.